In the first two parts of this series, we discussed features related to Pricing and Payment and compared the functionality of Magento e-commerce with that of Microsoft Dynamics GP. This, the final installment of the series, discusses how the two systems compare regarding Order Processing. Backorders are generated when a customer purchases an item that is temporarily unavailable/out of stock. Once the item is in stock, it is shipped to the customer. In such a scenario, you can still process the order as a backorder, invoice and arrange to ship the product from another vendor. Magento’s e-commerce cart supports this feature, but Dynamics GP does not. Dynamics GP, on the other hand, updates the order generated but will never proceed with Shipment and Invoicing until and unless the inventory level is updated. To summarize, you can expect a backorder to populate in Dynamics GP, but you cannot have the Shipment and Invoicing information against that order in Dynamics GP. Magento takes care of that. Allocating inventory to sales orders earmarks stocked products for that customer and prevents a business from selling those items to someone else. Inventory automatically will be allocated to the goods-out note when you fulfill an order. Or, if you want to reserve inventory on an order before fulfilling, allocation of inventory can be done on individual or batches of orders, as well as across all orders with unallocated items. Microsoft Dynamics GP follows both Line Item allocation and Document/Batch allocation. Line Item allocation reserves selected items as they are entered into an order, with each item’s availability verified during data entry. Document/Batch allocation reserves selected items for a batch of orders; verifying the available stock during allocation and not during data entry. Magento uses only the Line Item allocation process, so don’t expect the cart to check items during document/batch allocation. Order processing typically involves three vital steps – Order Fulfillment, Shipment and Invoicing, in that order (in most cases). But different systems are free to define and follow their own process. For instance, Magento allows Shipment first followed by Invoicing, or vice versa. On the other hand, Dynamics GP has the following two options – Custom workflow and Fulfillment workflow. In Custom workflow, Shipment and Invoicing can come in any order, but in Fulfillment workflow Shipment must happen before an Invoice is generated. It is important to understand this difference as there is no one standard, and clients are free to follow their own process. 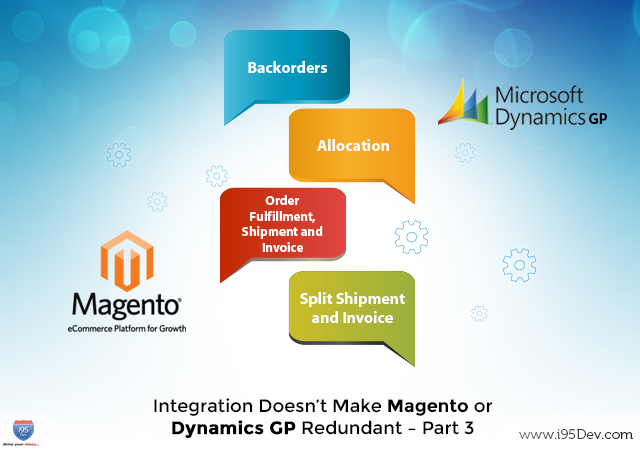 Now imagine a situation where you follow the Fulfillment workflow in Microsoft Dynamics GP and have created an invoice for an order in Magento while shipment is still pending. In that scenario, the changes won’t be reflected in Dynamics GP because Fulfillment workflow doesn’t allow that. Imagine your customer purchasing 100 count of a product and shipping it in three steps: first 30, next 20 and then 50, on three different days. In Magento, she can get the invoice for the full 100 at one time, or even split it, as needed. This feature of Split Shipment and Invoicing is available in Magento. Microsoft Dynamics GP does not allow such a feature, instead generating invoice as per shipment. Dissimilarities exist between these two systems because they were built for a specific purpose. With i95Dev Magento Dynamics GP integration, we have empowered the two systems to find a common language for communication, in some cases by extending the functionality in one system and in others by limiting it. Lastly, integration is a complex process and needs effort, both from the client seeking integration and the business providing it, to build the desired solution (with realistic expectations). In spite of so many differences between the two systems, our i95Dev connector integrates these disparate systems and significantly adds value to your business. To learn more, please feel free to connect with us at http://www.i95dev.com/contact/or give us a call at 301.760.7499.